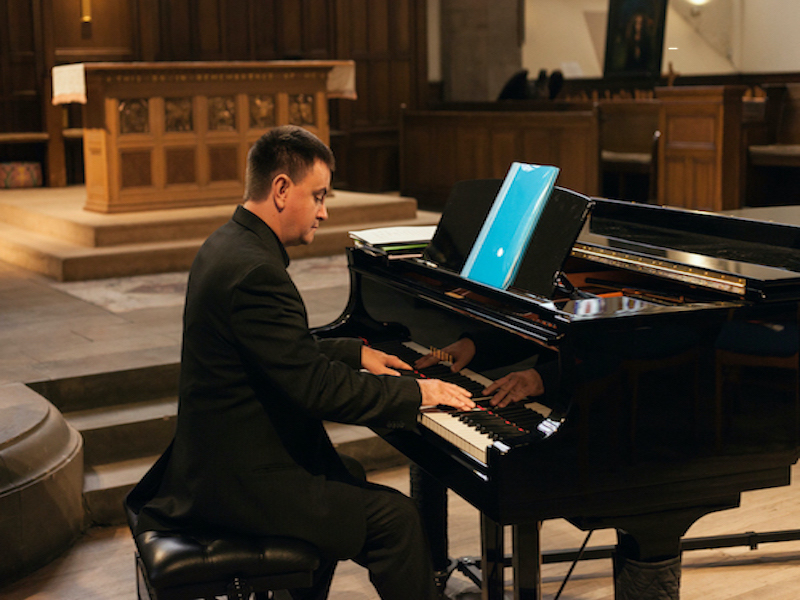 A hugely versatile and sensitive pianist who's friendly and professional approach, along with his extensive and bespoke repertoire, will ensure that you get the perfect mix of music for your event. Classical, smooth jazz, pop and original piano music available for any event. There are many ways to incorporate piano music into your event. Based near Pontypridd, South Wales, this pianist offers a bespoke service and a wide variety of music. Music performed can be from his own repertoire or can be specific pieces of music which are relevant to you or your event – he can play anything from Ed Sheeran to The Darkness, Debussy to Disney and everything in between! For weddings he can also provide recordings of any of the music you have chosen for him to play (additional charges apply) so that you have a musical keepsake of your special day. There is a wide variety of music on his playlist, from classical, film, show tunes and jazz, to rock and pop songs and he can also provide light original material that can set the perfect mood. A full-size stage piano and PA gear can be provided if there is no piano at your event or venue. Hugely versatile and sensitive pianist with a wealth of performance experience! Repertoire covering classical, film, show tunes, jazz, popular and more! Highly talented musician who has studied music at The Royal Welsh College Of Music and Bath Spa University College! Based on a 1 hour set. It was a lovely evening everything just fell into place your music set the theme and helped enormously to create the atmosphere, many thanks it was lovely to meet you too, everyone had a great time and we have an night to remember. Just a note to thank you so very much for your fantastic piano playing on Friday at our daughter’s wedding! From the very outset you helped us so much, and we were very pleased at how you ‘got involved’ and made such valuable suggestions prior to the big day. As we had chosen more ‘pop’ music for the event, we were not sure how it would translate into a piano solo, and your reassurance on this was invaluable. You were so receptive to our ideas, and keen to find out exactly what we wanted for our ‘big day’, and ensure that you delivered just what we wanted! Needless to say, your piano playing was superb, and the ceremony music we had chosen sounded fantastic. Many of our guests also commented on how much they enjoyed your extensive repertoire both before and after the actual ceremony pieces. We were impressed at how smartly attired you were, clearly making the effort to fit in with the type of event – this is so important. You were attentive, polite, chatty and great fun – we could not have wished for anyone better! Once again, thank you for helping to make our daughter’s wedding day so special! I had the absolute pleasure of walking down the aisle to the sound of him playing our chosen song at our church wedding and the memories continue to give me goosebumps. We met with him a few months before our wedding and we knew straight away that we wanted him to play in the church. A gifted pianist, he was open to playing anything and offered us many ideas. We would definitely recommend him, he completely took the stress away from us, all I had to do was walk down the aisle and enjoy our service. He added that extra special touch. Throughout the planning stage to opening our much appreciated wedding card and CD the day after, He went above and beyond and we knew he would work with us to achieve what we wished. Thank you for being part of a cherished memory and the most special and outstanding moment of our lives! He set the perfect atmosphere at our wedding playing the piano we had hired. He is an exceptional piano player, playing both classical and contemporary music, and it was commented by both guests and staff at the venue how talented he was, and what a great idea it was to have him playing during the wedding breakfast. We can definitely recommend anyone who is contemplating having him play at any event that he will do a 5 star job.